All tickets are subject to a service fee at the Box Office, on-line and via telephone.James Davis is a rising force in comedy. Hood Adjacent with James Davis premiered on Comedy Central to rave reviews, where Davis will explore contemporary urban topics and share his perspective on the world he grew up in through a unique, hybrid style of comedy that bridges the gap between urban and mainstream comedy. Prior to this, Davis was writing for The Late Late Show with James Corden on CBS, and was a recurring character on Kevin Hart’s hit show, Real Husbands of Hollywood. 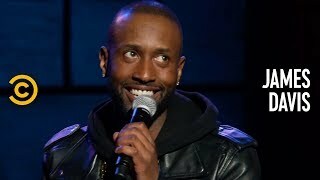 In addition to his Comedy Central series Hood Adjacent with James Davis, James can be seen performing on Kevin Hart Presents: The Next Level, also on Comedy Central. Must be 21 & up to enter; except on Friday's at 10:30pm which is 18 & up to enter.